Need to buy eight rear weights for my JD 24" wheels. JDs price is $100. per, but would buy any brand as long as they fit, if cheaper. 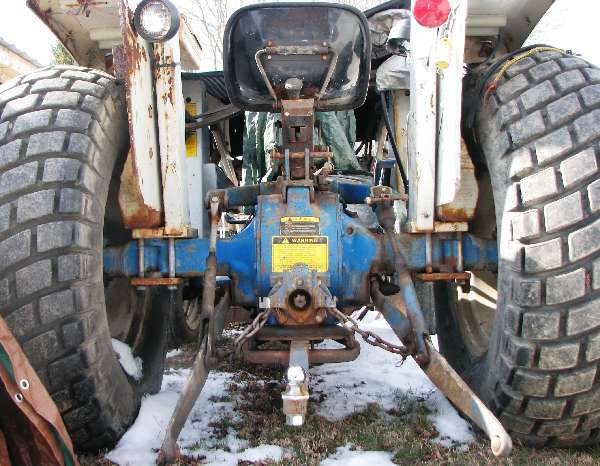 My dilemma, Will be adding to my collection of implements an Addington Grapple for the loader. The grapple weighs in at about 800lbs, that isn't a problem when I have the backhoe attached (1500lbs) but when I have the logging winch (580lbs) attached I'll need more ballast but I can't load the rears because I use the tractor for finish mowing near a wet spot in the summer. I don't want too buy an extra set of wheels & tires at $1,500. to have one set loaded and the other not. I've also thought of fabricating weights via plate with rod and lifting weights but then they would stick out beyond the tire quite a ways with trying to get 200lbs per tire they would get damaged moseying around trees in the woods. Most wheels are made by Firestone for all manufacturers so most would interchange. I'm sounds as though you may want to have the winch attached at the same time as the grapple. If you're just thinking of using the winch for ballast, I would suggest pouring a concrete counterweight for your 3pt and removing the winch. Mine works slick and the tractor is rock solid even with the biggest load I've put in the bucket. Why not just make up a two piece set of heavy steel plates, one for the front & one for the back of the winch. If you make (or get) them the same size & shape as the winch you will hardly even know their there. Just put a heavy bar between them front to back outside of each side just above the lower hitch points to hold them up. If they bolt together then they could be removed when not needed. Thanks for the ideas. I forgot to mention that while I have the winch on I will be logging and the more weight I have on the winch the less trees I can hall. No if it were just for ballast I would use the hoe all the time. I will be use the grapple to pile logs and feed brush to the burn pile.